waah another ! welcome, welcome to the thread! I think we BD shippahs all wish they are a real couple! and I know the feeling, we all do BD marathons once the bug has bitten you! It's great to see the BD thread up and running again! Couldn't log in to soompi for the past couple of days... it got kinda frustrating... back thankfully it's fine now! Welcome back ChocoMilkShake and to marcs.lover, too!!! It's BD reunion for all!! Enjoy the thread and share all your BD memories, we want to hear them! On the way, she stops by Min-chul's office and sees him sleeping on the couch. She moves in and covers him with his coat, waking him. Yeon-Soo explains she is here to celebrate with Sae-na and thanks him for helping Sae-na fulfill her dream. Min-chul asks her about her dream, Yeon-soo tells him she hopes to draw forever and have a family of her own. Just as she is leaving, her cell-phone rings. 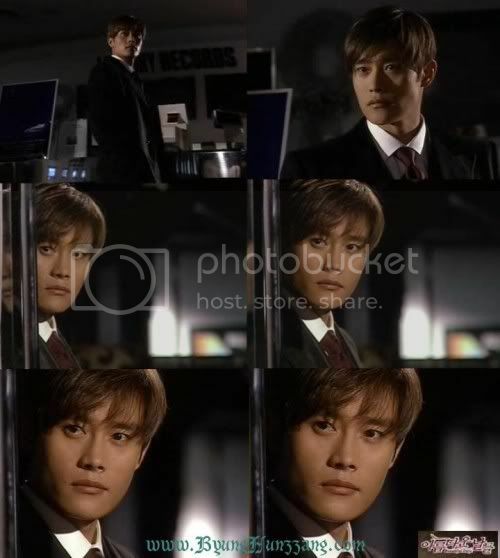 Min-chul shows his anger and stops her from answering, he disconnects the call when he hears San-jae's voice. Consumed with jealousy, Min-chul demands to know why San-jae has her number; greatly hurt by Min-chul's rage, Yeon-Soo dashes out. 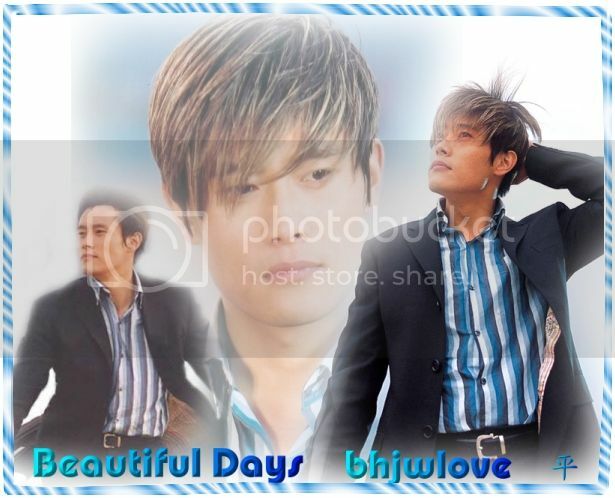 BEAUTIFUL DAYS FOREVER!!!!!! The only TV series that one can watch over and over and over again. Nobody that watch it will not be affected by the characters of Minchul and Yeonsoo. The more you watch it the more you'll love them. Once you get hooked into the series, there will be no escape route. And we are all willing victims. Let us all enjoy this moments. wow! Precy(elbie-h forever)( I hope it is ok if I call u that here?) Love ur siggy! "Falling in love with someone is like drinking seawater. Its refreshing cool when you drink it but thereafter, you feel thirsty. The more you drink, the more you're thirsty and the stronger the craving." and ur right! there is no escape route once hooked! Hi Solangel, welcome to the thread! Yeah... I know the song that you're saying, the one sang by Saena's rival... what's-her-name-now ... it sure had a catchy tune and more than often being played during the series too, supposedly picked/arranged by Minchul. Even had its own MV shooting, as I recall. Too bad that it wasn't included in the OST... and have no idea of the title either. hihi... this is a repost of a MV I made...=) Enjoy!! it's quite a huge file though.. hiakz hiakz... The latter part of the MV has some of my most favourite scenes in BD... oh my... i'm estatic watching it again!!! Minchul went back to Victory Records after sending Minji home. Feeling tense after the quarrel with Seonjae, Minchul needed some air but got a pleasant surprise seeing Yeonsoo doing some 'overtime' ... he decides to join her.. The loud music in the middle of the night to startle the poor girl must have given her a heart-attack but the coffee that he made later would surely compensate everything. 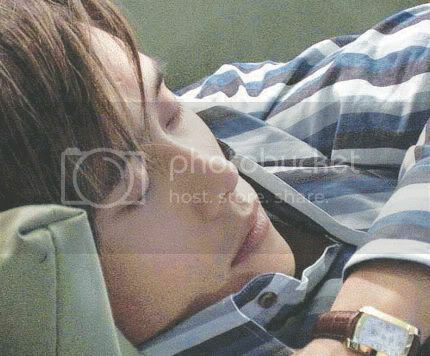 Sleeping MC, thanks to Cha Park for the captures. Oh Purple Daze, I so agree with you... the subtleness of LBH's acting is just what's makes everything look real. He's a man of fault and he doesn't like to be weak.. the anger before that, scaring Yeonsoo was something he never even expected. One moment, they were sharing tender exchange between them. Him asking her about her dreams and hopes, & looking forward to go home together... and Minchul completely lost himself over a single phone-call (which could have meant nothing but not to him) ... totally giving in to his jealous rage only to realize it a little too late. For someone so in control before this... the event just made him realized he's just a man with emotions and that he's in for something big where love is concerned. He may not want to lose to Seonjae at the time but truth was, he spoilt everything... Minchul that is, by scaring Yeonsoo away. And the morning after, didn't you just love his uncertain ways when he looked for Yeonsoo at the shop... without a word, just looking at her back & forth but you know... his eyes were showing that he's feeling lost and saying "please forgive me"? Doing overtime seems more fun... when you have company and coffee. Na-rae tricks Yeon-soo into attending the opening of Min-chul's new company. Yeon-soo sees Min-chul and rushes out, Min-chul runs after her and enquires about her health. Yeon-soo turns away and enters the elevator, unable to supress her emotions, she cries to herself. Min-chul notices that the elevator remains stationary ; he sees Yeon-soo crying and embraces her. Yeon-soo is resolute about her decision to keep her distance, she breaks away and runs down the stairs. Love makes time stood still... by instinct, they just can't let each other go. By action, the elevator doesn't move. By fate, love brings them back together. the happy siblings together.. before the storm.. that waits at home.. Artwork credits to original source(s). Min-chul misses Yeon-soo and waits outside her school to catch a glimpse of her. Yeon-soo sees him and rushes down from the bus. Min-chul tells her that this is an incidental meeting and she should not take their reunion seriously. Although it's clearly a very sad scene, I've always loved this part... because this was when Minchul really could not control his heart to see Yeonsoo. He planned to only look (he wasn't even supposed to see her) at her and leave but he just stood there watching even as Yeonsoo discovered him by the roadside. And when Yeonsoo got off the bus to look for him, only then he quickly went hiding... but not for long... he just could not see his one love looking so vulnerable. Perhaps, most probably it's Minchul who's more vulnerable... when he left her, he'd also lost his only friend, confidante... one whom he opened his heart to. And with the Victory Records scandal, he needed more to see her... maybe just to feel a little secure by seeing how she's doing, although he won't say it... of course, Minchul being Minchul. I totally love the scene in the café, both of them exchanging glances... looking at each other when the other turned away or looking down.... not wanting to lock eyes because when that happens, nothing .. nothing will stop the tears and emotions. And when Minchul could not control his voice... almost breaking down... it just breaks my heart. And of course the song played in the background for this particular scene, 'Say Goodnight Not Goodbye' makes it even more bittersweet. Minchul took Minji home. When they got home the father yelled at Minji. She screamed at her father and told him she did not want to be home with Sunjae and his mom. Sunjae defended his mom and told Minji that she acted like a seven years old kid. She always made trouble for their parents. How long is she going to behave this way. He told Minchul that he is not helping matter by covering up for Minji. That maybe he pushed her to act up like that. Sunjae told him that they lived in this house for fifteen years, can they just try to get along, that they are family after all. Minchul screamed back at Sunjae and said that he wished that they were not related. That night Yonsoo had to stay late at work to finish the art project for the store. She heard someone turn the music on. She went to look, did not see anyone. Turned the music off, she went back to the table. Minchul walked up behind her and just standing there staring at her. When she saw him, she jumped in shock. He complement Yonsoo for her art. He went and got two cups of coffee for them. Then he turned the music back on and told her that she needed to put music on when she is alone so that she would not be afraid. He then left her to her work, and he went to work in his office. As the two of them worked separately they were thinking about each other. When Yonsoo tried to hail a taxi to go home, Minchul pulled up with his car. He took her home. Hi Rubie! This was a great scene. I especially love the part when he couldn't keep himself in hiding as he saw her falling to the ground in sadness, like he couldn't stand seeing her in pain. The look on his face said it all and it showed us that his feelings for her were not dead at all. And in the cafe, they don't say much to each other but the looks that they gave each other was enough. Have to give credit to CJW & LBH for showing us their characters' emotions even without the words. I often wander how many takes it took to shoot this scene.